Ryan's right in that BBM did start to increase the number of sets they did each year in the late 1990's but I think real explosion happened in the 2003-2004 time frame. It's pretty wild to look at the numbers. BBM has done a total of 514 sets in 25 years (well, 24 plus four months so far this year). The total number of sets they did their first 10 years (1991 to 2000) was only 64. The total for their next 10 years (2001-2010) was 260. Their total for just the four plus years since 2011 is 190! After I did the counts, I decided that I needed to sit down and (finally) generate the complete list of BBM sets based on what was listed in SCM #110. It took a couple weeks to do, but I've now added this list to the Set Index page. The sets are listed in the same order that they appear in SCM - the odd change in how the sets are listed around 2012 is due to a change they made, not me. 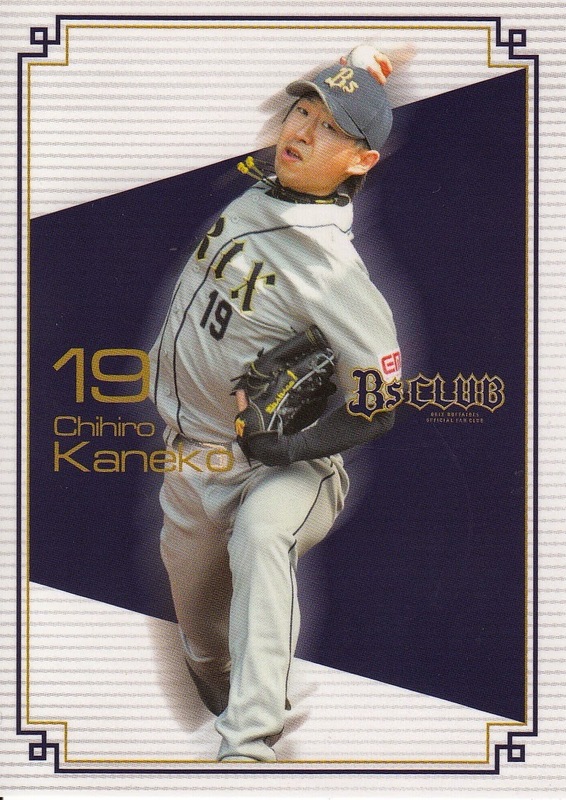 There are a number of sets that they list in a particular year even though the year shown on the front of the card is different - for example the "Memories Of Uniform" set has "2015" on the front (so I consider it a 2015 set) but SCM includes it in the list of 2014 sets. I've included Engel's set notations where ever possible - since he hasn't done a modern checklist since mid-2008, his number stop there. Engel actually lists a number of sets that SCM does not - I'll be adding them to the set index separately. As far as I could tell, there was only one pre-2008 set that SCM listed that Engel did not which is pretty damned impressive if you ask me. I've included links for any sets that I've written about - I think I've actually written posts on about 30% of the sets. What I'd like to do is further expand the set index by including similar lists for the Epoch and Front Runner sets. The Calbee sets are fairly self expanatory and any major earlier sets are already well covered by Engel. 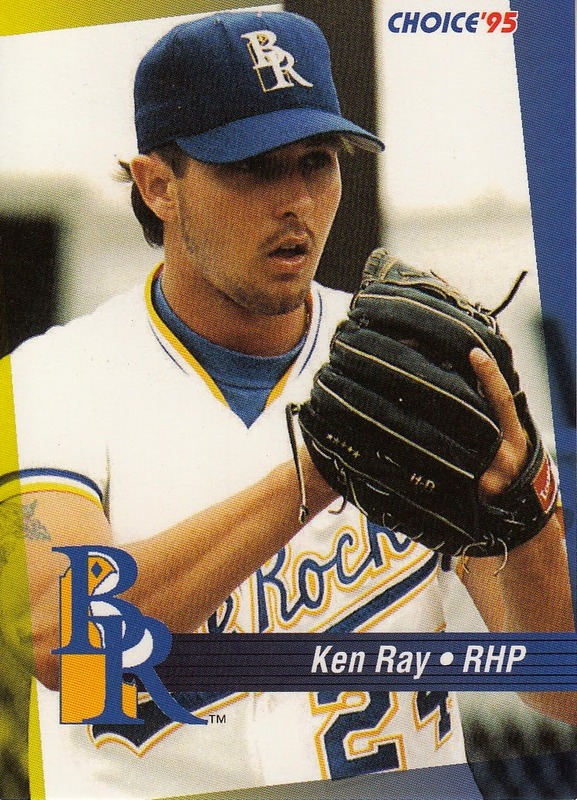 Kenny Ray of the Eagles did something no one else has ever done before this past week - he became the first pitcher in his 40's to win his first four starts of the season. 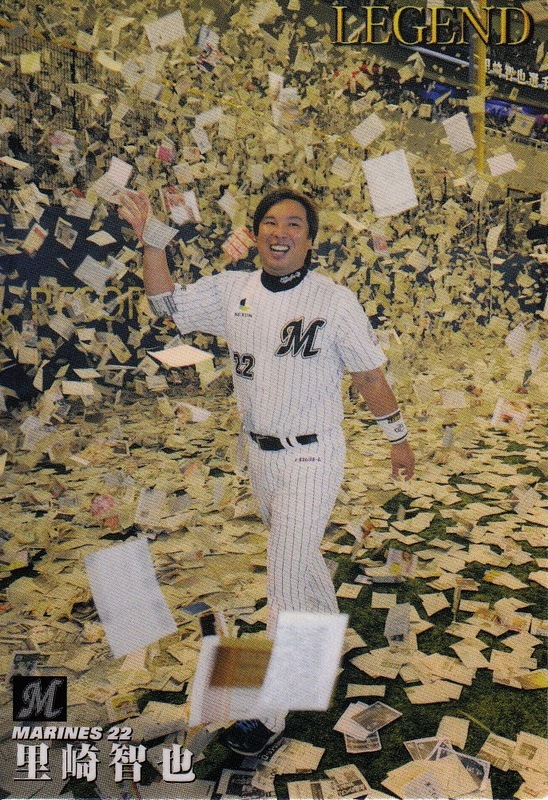 The previous record of three was set by Lotte's Choji Murata in 1990. 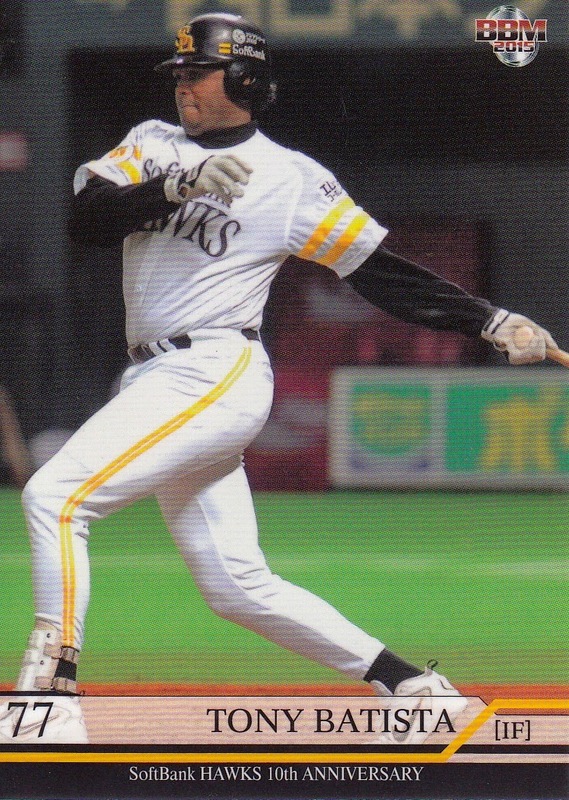 This is Ray's second stint in Japan. 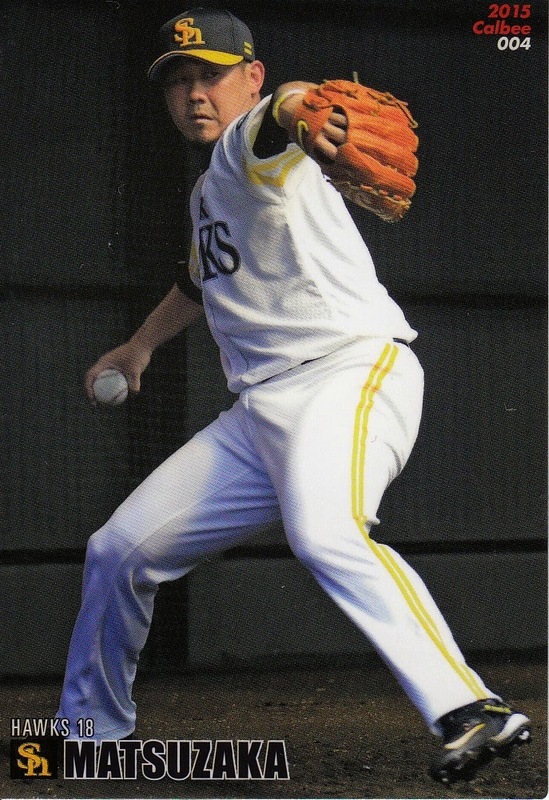 He had previously pitched for the Eagles in 2013, making five appearances (including three starts) down the stretch. 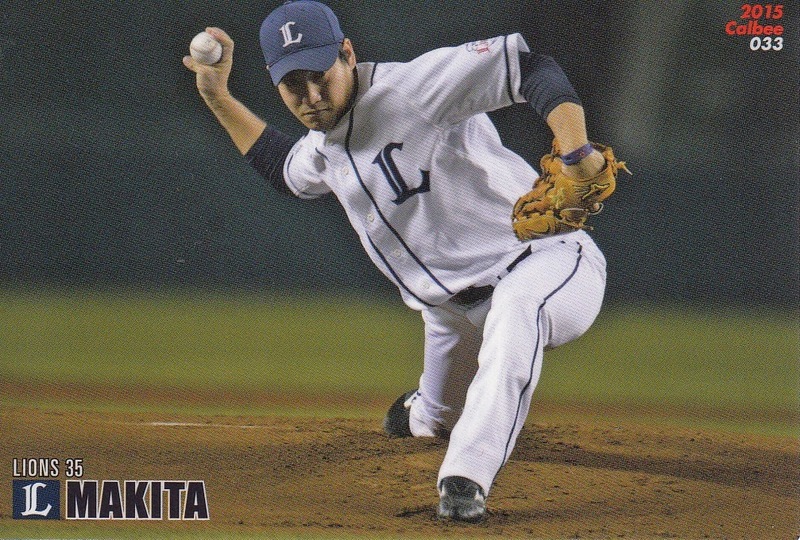 He also contributed five scoreless innings in the post season. 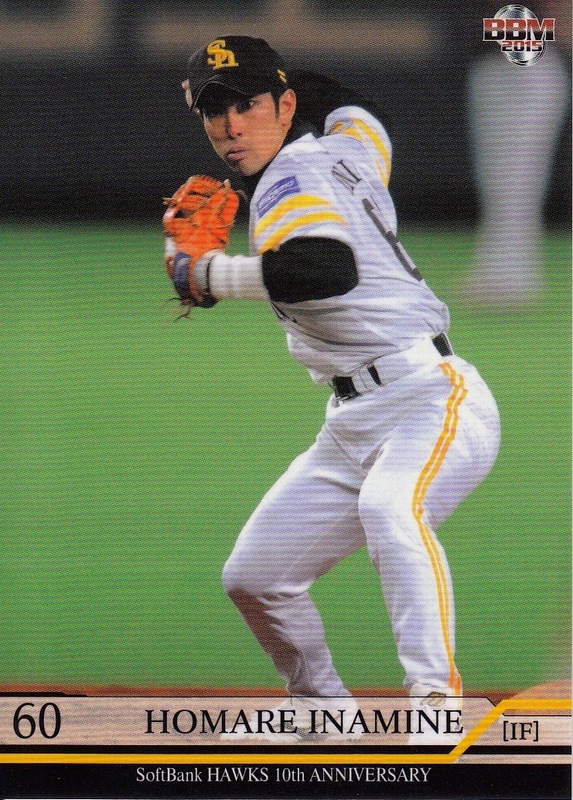 I was kind of surprised to discover there are almost no Japanese cards of Ray prior to this year. 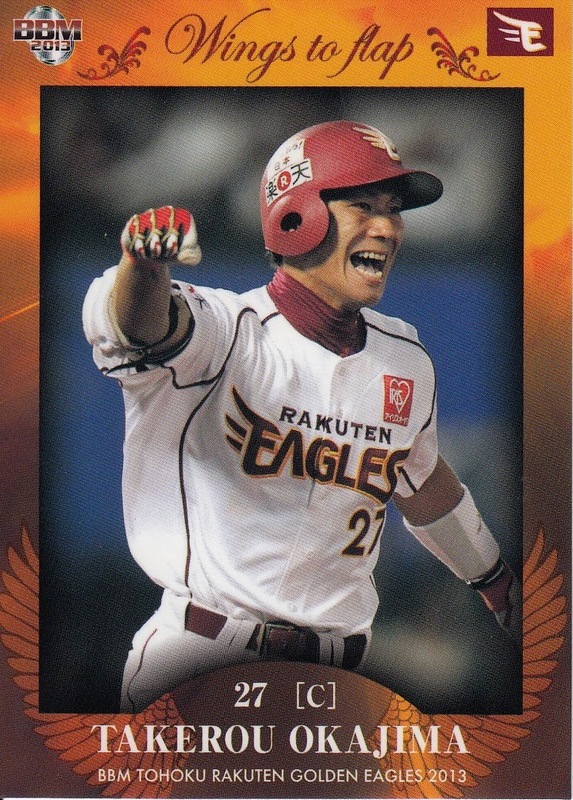 It looks like he didn't sign with the Eagles until mid way through the 2013 season (his first appearance with the ichi-gun team was in mid-July) so he didn't make it into any of BBM's sets that you might expect to find him in - 1st Version, 2nd Version or the Eagles team set. He's also not in the Eagles team issued card set. 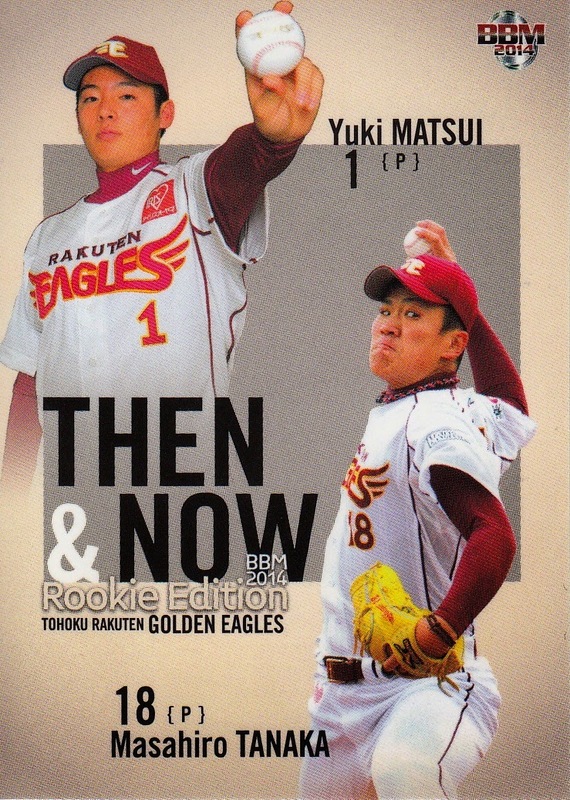 I was kind of surprised to see that he did not appear in the "First Crown" box set that BBM issued to celebrate the Eagles' first ever pennant. 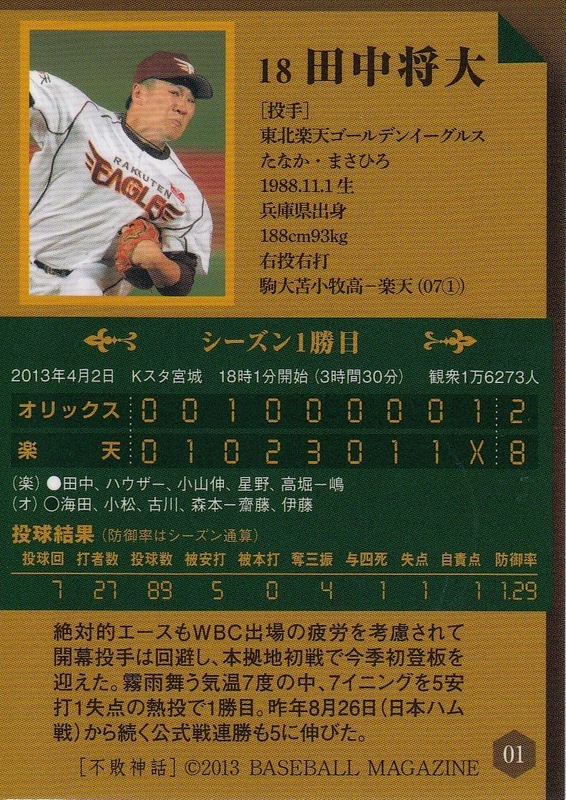 And since the 2014 BBM Eagles 10th Anniversary set only had a "Best 9" for the 2013 team, he didn't make that set either. 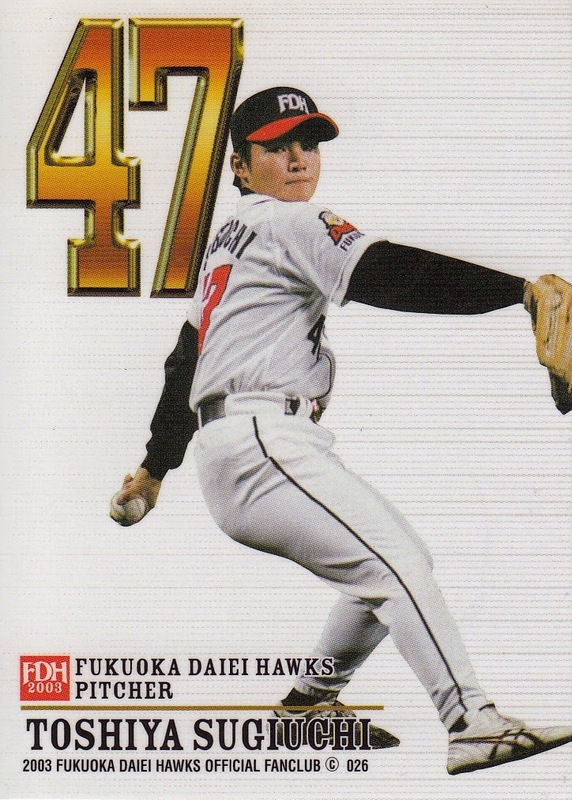 According to the work that Jason's done over at SportsCardForum, the only Japanese card of Ray from 2013 was from the fourth series of Owners League cards that year (#119). 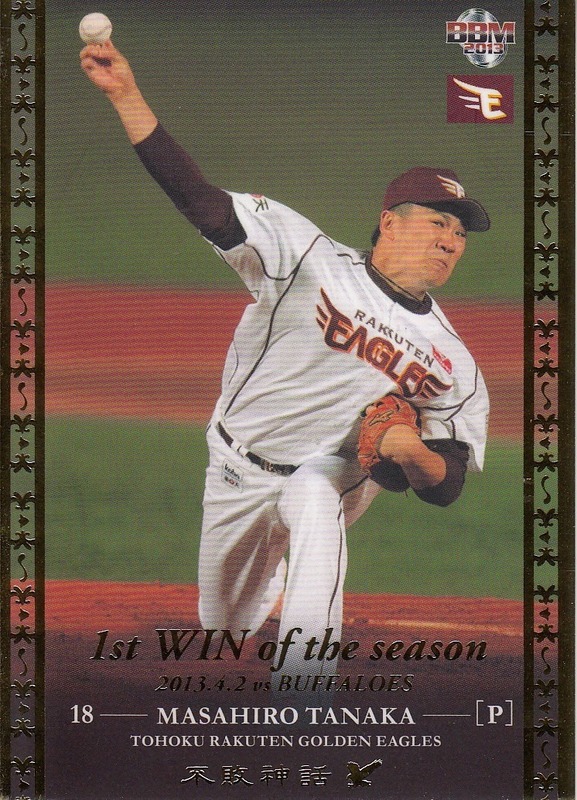 He is in the new 2015 BBM 1st Version set (#140) as well as the BBM Eagles team set (#E18). 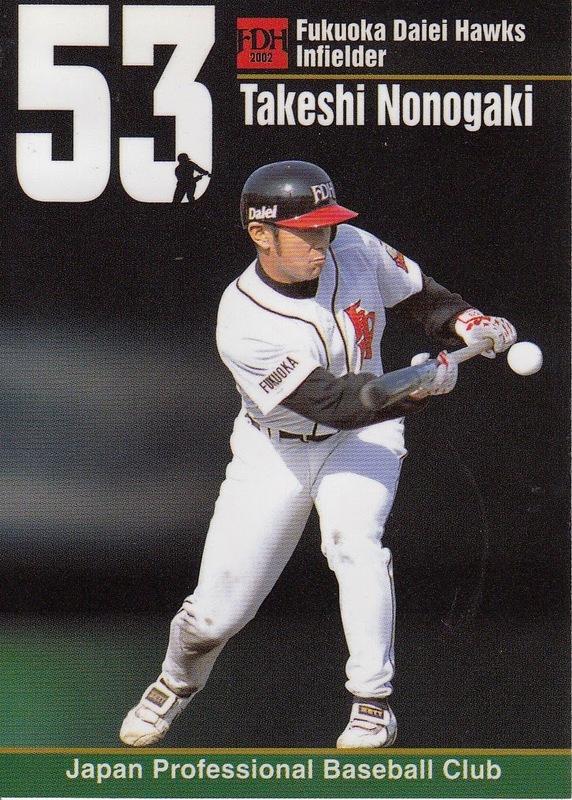 Had BBM continued to do Nippon Series sets, he would have had a card in the 2013 edition of that set. 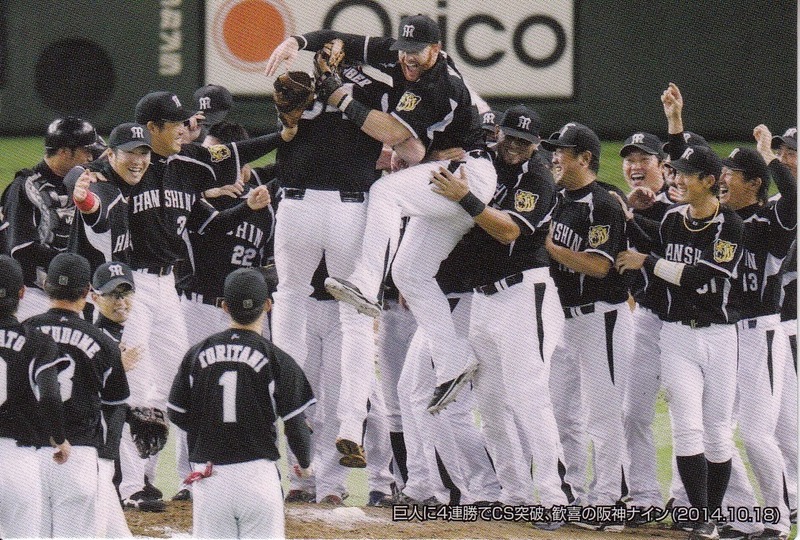 2013 was a pretty amazing year in NPB. 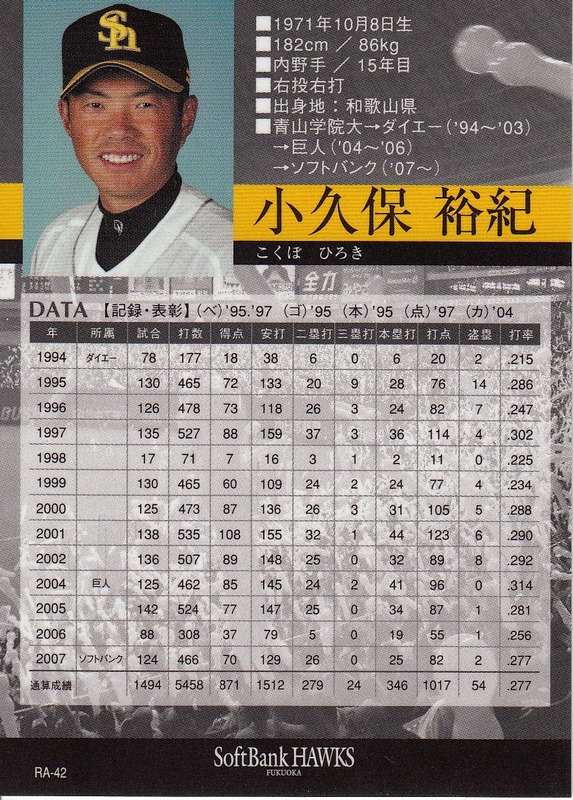 In the Central League you had Wladimir Balentien chasing (and eventually passing) Sadaharu Oh's record for most home runs in a season (which was actually shared by Tuffy Rhodes and Alex Cabrera but they did it in the Pacific League) while in the Pacific League you had Masahiro Tanaka chasing an undefeated season - eventually ending the season at 24-0 while leading the Tohoku Rakuten Golden Eagles to their first ever pennant and Nippon Series championship. It was a lot of fun for me to follow here on the East Coast of the US, waking up every morning to see what the two of them had done or (even better) getting to tune in via Justin.tv to watch them do it. 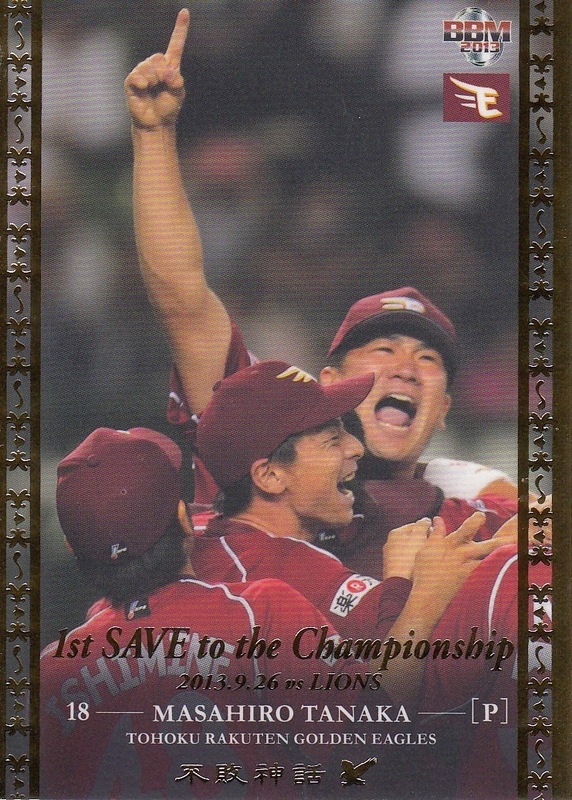 BBM published a box set in November of 2013 that celebrated Tanaka's 24-0 season. It was called something along the lines of "Unbeaten Legend" although according to Ryan, the kanji for the title could also be translated as "Invincibility Myth". I like the name "Invincibility Legend" myself so that's what I've been going with. You're probably asking yourself what the other three cards in the base set are for. 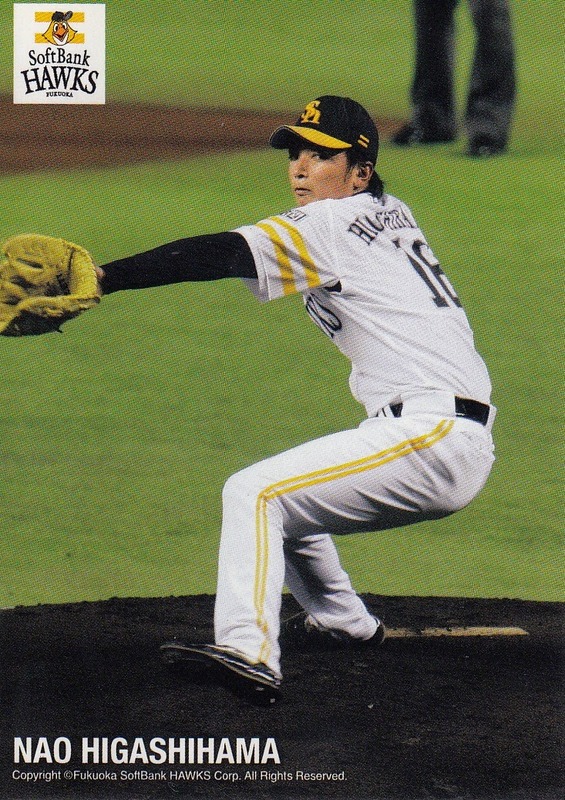 One of them is for Tanaka's only save during the regular season that year - Eagles manager Senichi Hoshino brought him in to close the game in which the Eagles clinched the Pacific League pennant on September 26. 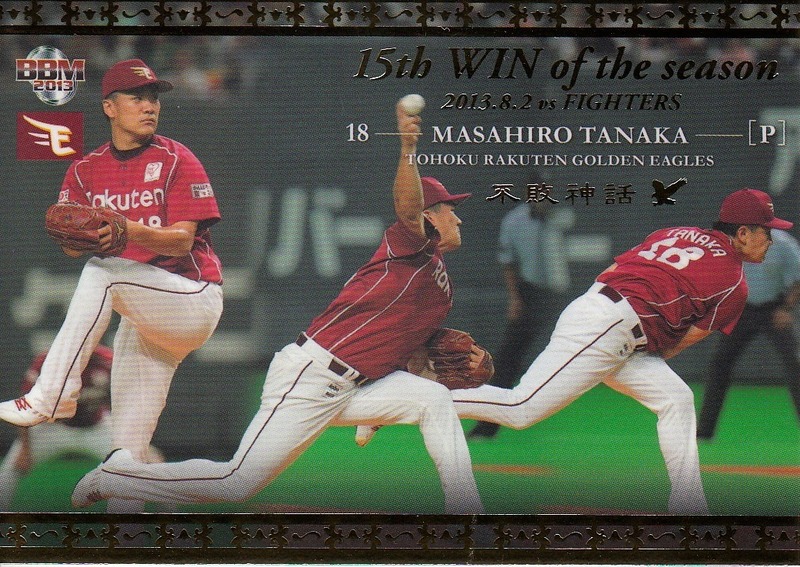 Tanaka's winning streak actually started with his last four wins in 2012 (for a total of 28) and one of the other cards in the set commemorates the first win of the streak against the Fighters on August 26, 2012 - the card is called "PROLOGUE to the Legend". 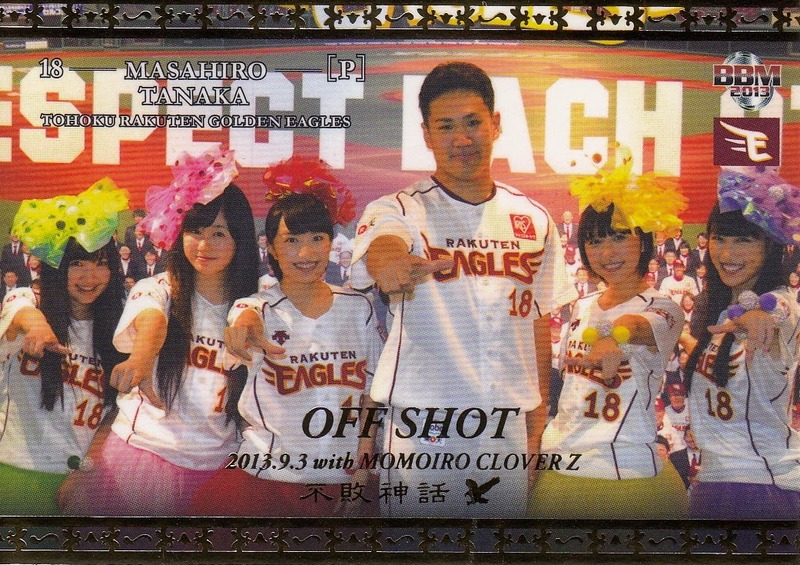 The final card in the set is a shot of Tanaka with the idol group Momoiro Clover Z, of whom he apparently is a big fan. This was a difficult set to track down. It had a print run of only 1500 sets and it seemed like everyone who got one was holding on to it. Ryan has been scouring the card shops in Japan looking for an opened set but coming up empty. I lucked into a set a few weeks ago on Yahoo! Japan Auctions. Total cost including shipping and kuboTEN fees was around $30 which is much higher than I would normally pay for an opened box set but considering how rare these appear to be, I wasn't too unhappy about it. You can see all the base set cards over at Jambalaya. Ryan's post on the set goes into some detail about the premium cards that were also in the box with the base set. 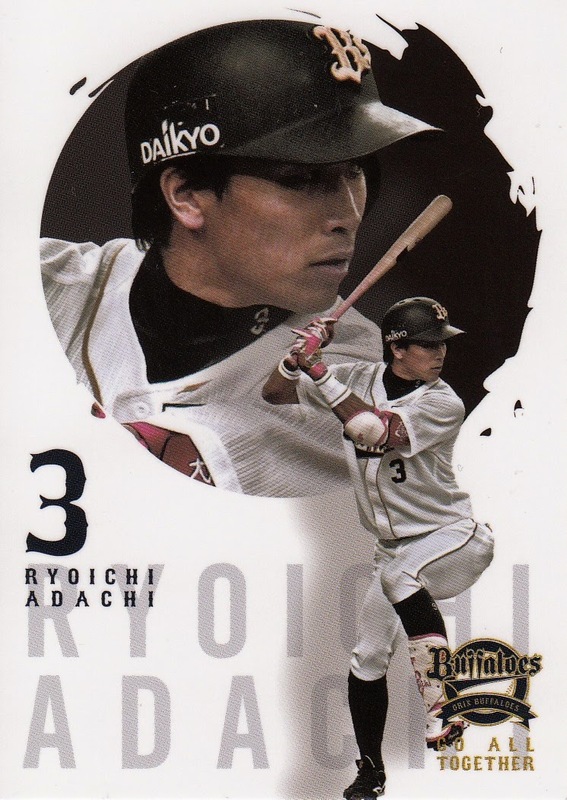 - Front Runner Trading Cards latest offering is the third in their Heroes & Rookies series - this time it's for the Baystars. This is a box set containing 16 cards - a 15 card base set plus a possible autograph card. 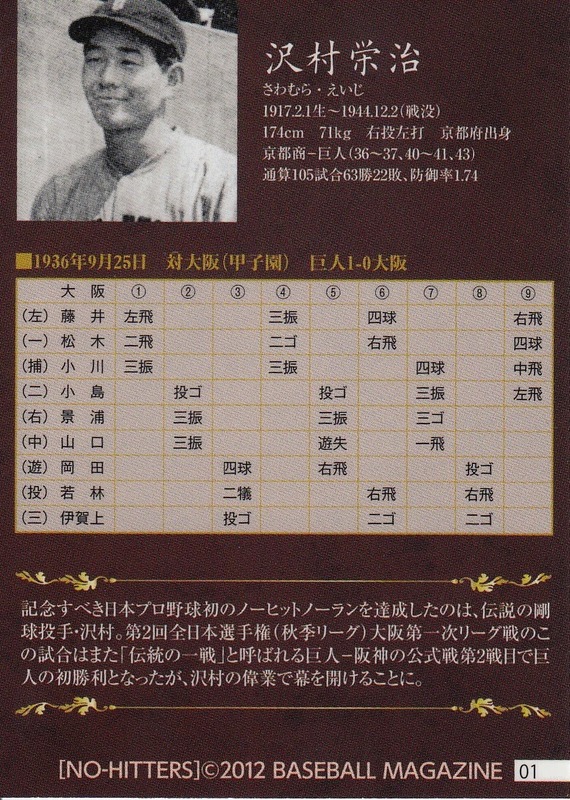 As usual, there is a bewildering array of possible autograph cards that includes cards with two, three or four signatures on it. The set is being released on April 29th (or thereabouts). 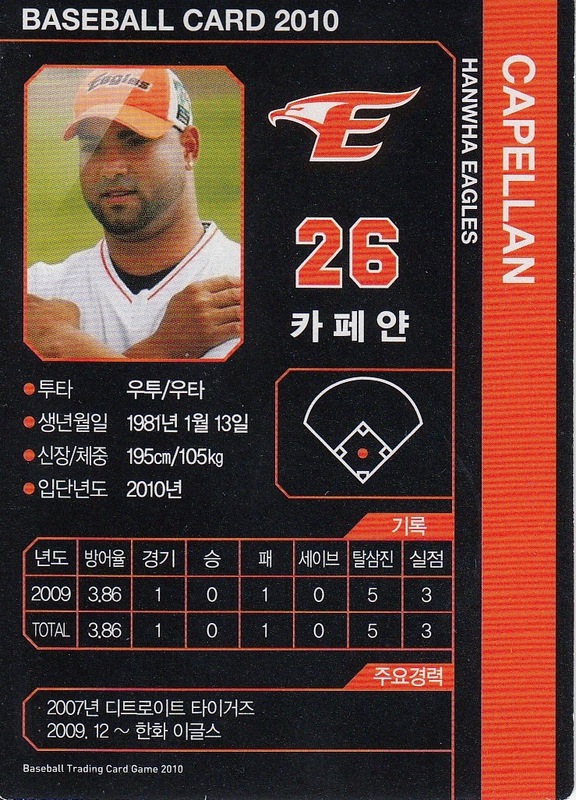 - Looks like Duael Entertainment is going to continue to publish "Super Star Baseball Cards" for the KBO this season. They posted pictures of the 2015 Season One box to their Facebook page yesterday. The set will be released on April 27. There really aren't any set details available (at least that I know about anyway) but just eyeballing the photos, I suspect that this set will be more similar to the Season Three and Blue Edition sets rather than the Season One and Two sets. That would imply a more expensive ($50-ish) box with a smaller amount of base set cards and more short-print cards. I would be very happy to be wrong about this however. I got another lot of team issued cards from Ebay in the mail today. 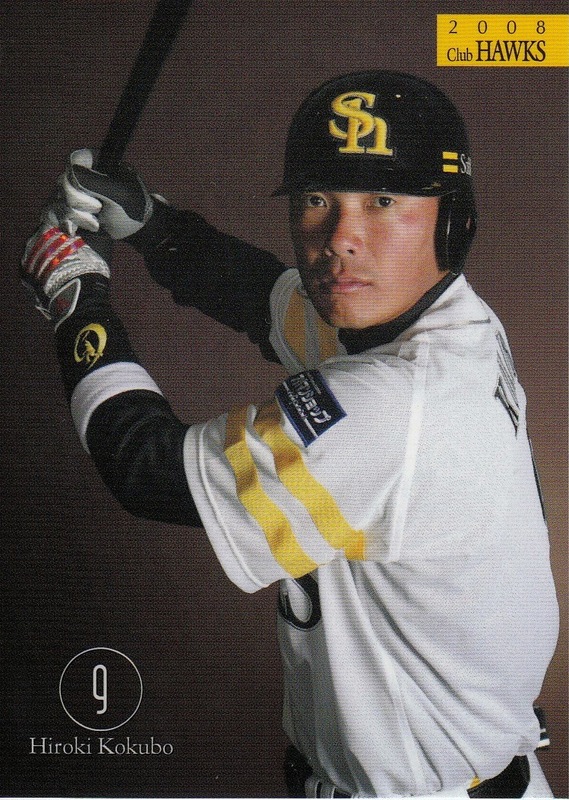 This batch is from the brand new 2015 Orix Players Card set - or at least that's what I'm calling the set anyway. 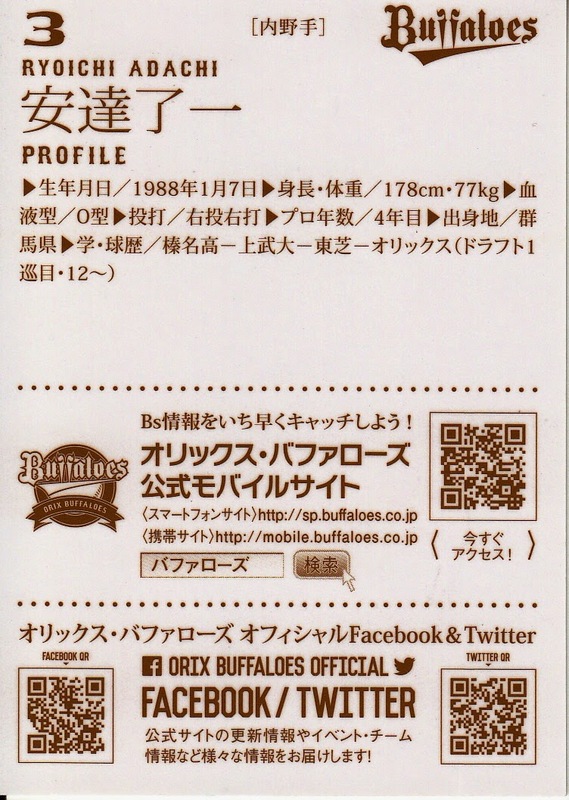 The QR codes on the back of the card link to the Buffaloes website, their Facebook page and their Twitter page. 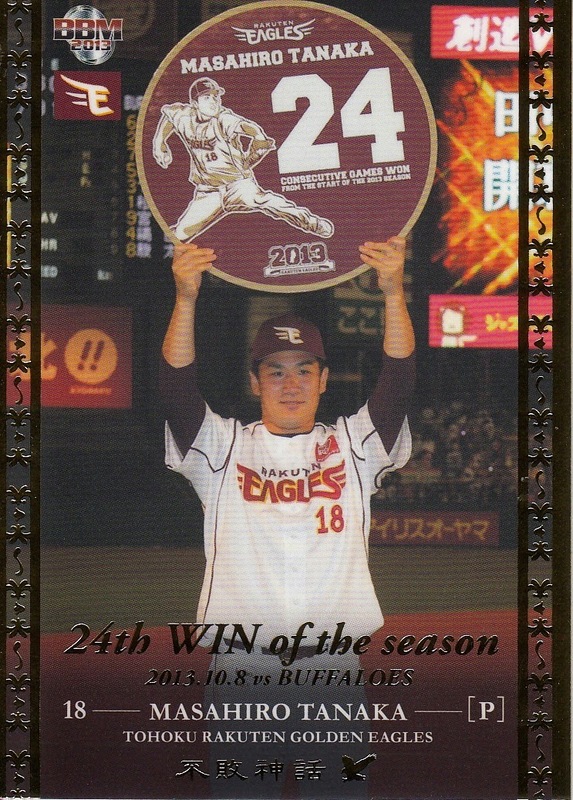 I did a little looking around on the Buffaloes website and I actually found some information about this set - it was a 75 card set containing all the players plus the mascots (and I assume the manager) that was sold in a binder for 3500 yen. It looks like production was limited to only 250 sets and the team has sold out of them. 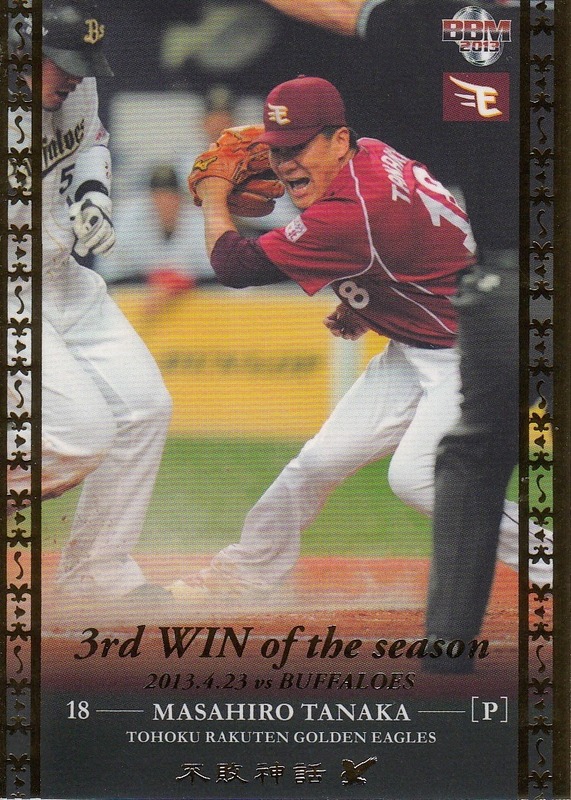 Apparently, the Buffaloes have issued a 70+ card set like this for each of at least the past five years - I found information on their site for the 2011, 2012, 2013 and 2014 sets. 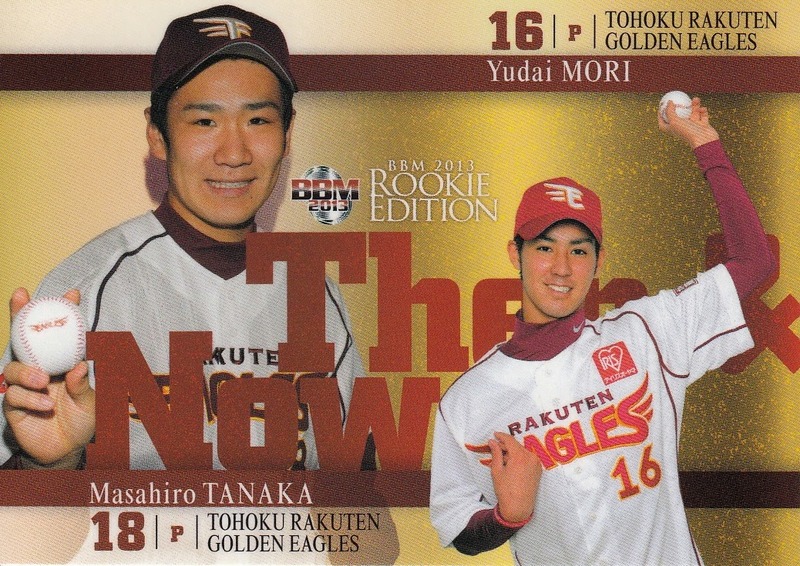 The 2013 set matches one of the other Orix sets that I have but the 2011 was does not. 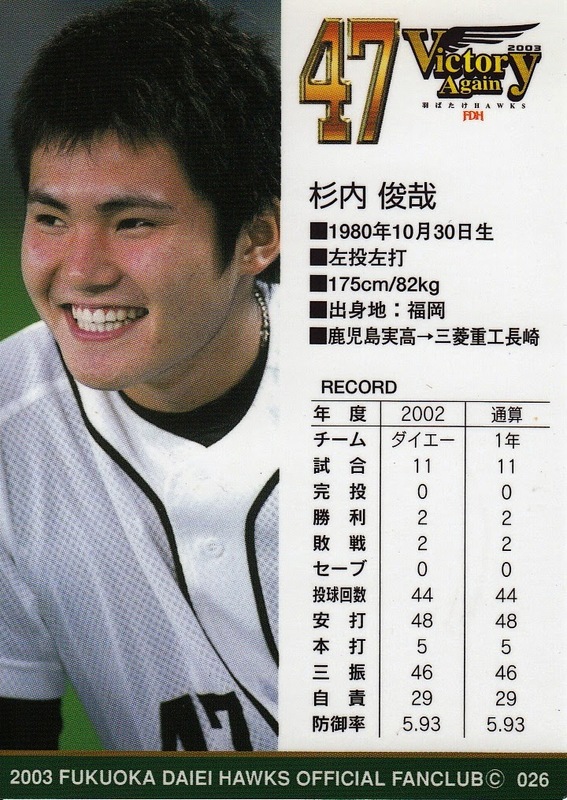 Based on what Jason's found as well as that 2011 set I have cards from, there are obviously other Orix sets other than the ones on their website. 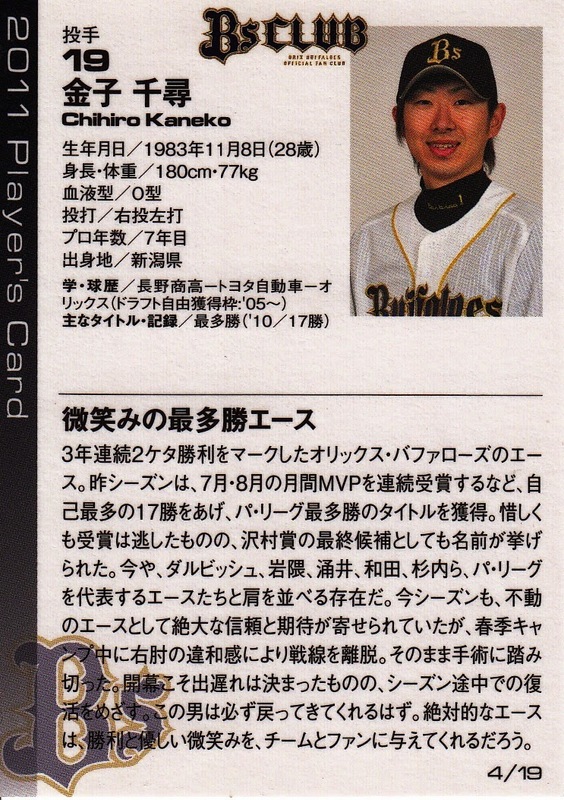 I did find it interesting as I went through their "goods" related headlines in their new sections to see that they had announcements for Orix card sets from both BBM and Front Runner Trading Cards, including sets that aren't exclusively Orix like BBM's 1st and 2nd Version sets. Unopened boxes for BBM's sets can be found in the team's online store. Here are some cards from some Hawks sets I've picked up recently. 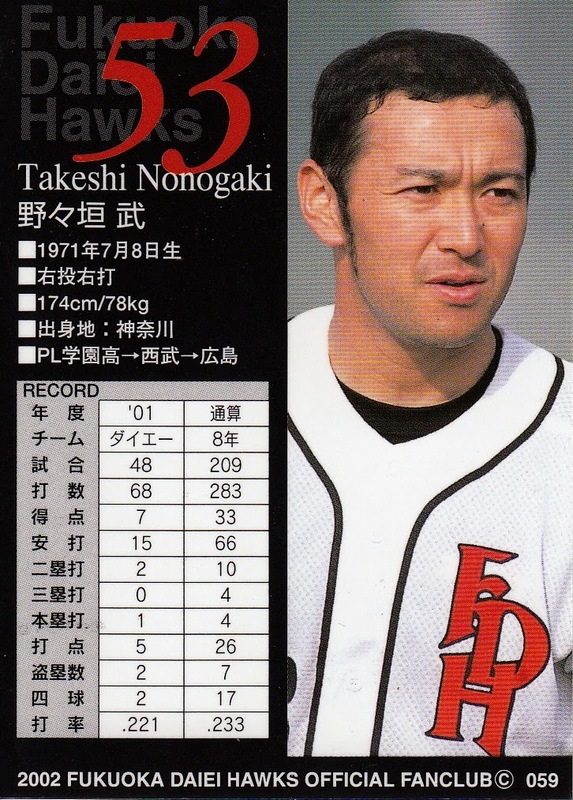 Jason has the list of all the cards I have (and their numbers if applicable) at his mongo Japanese team issued cards post. The QR code appears to be a dead link. There appear to be at least two different versions of the 2014 "Hawks Players Card" sets. One has action photos and the other has posed photos of the players pointing at the camera. The backs are identical. And by that I don't mean they use the same design - I mean that the backs of all the cards in the two sets are exactly the same. One interesting Hawks set that Jason lists is the 2015 "Spring Camp" set. 17 of these cards were available on Ebay recently although they were a bit more expensive than I was willing to pay. 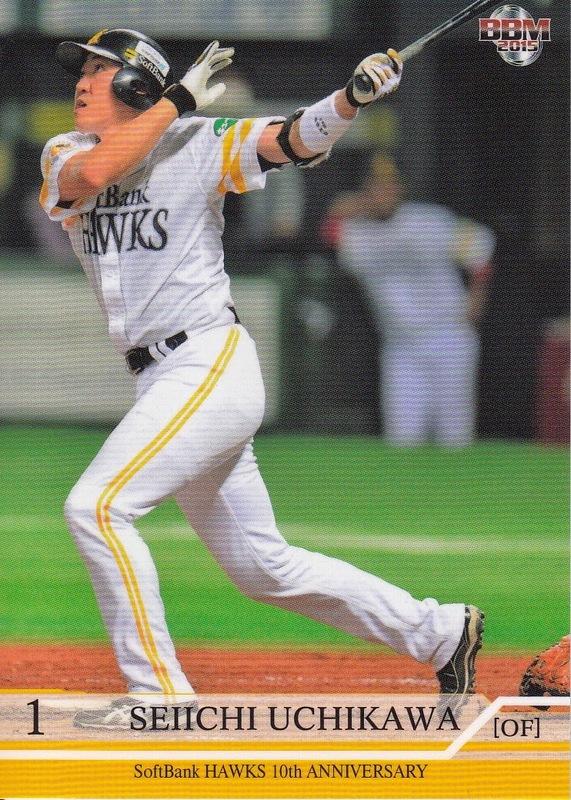 According to the seller, they were available only to fans visiting the Hawks spring training in Miyazaki and are fairly rare in Japan. 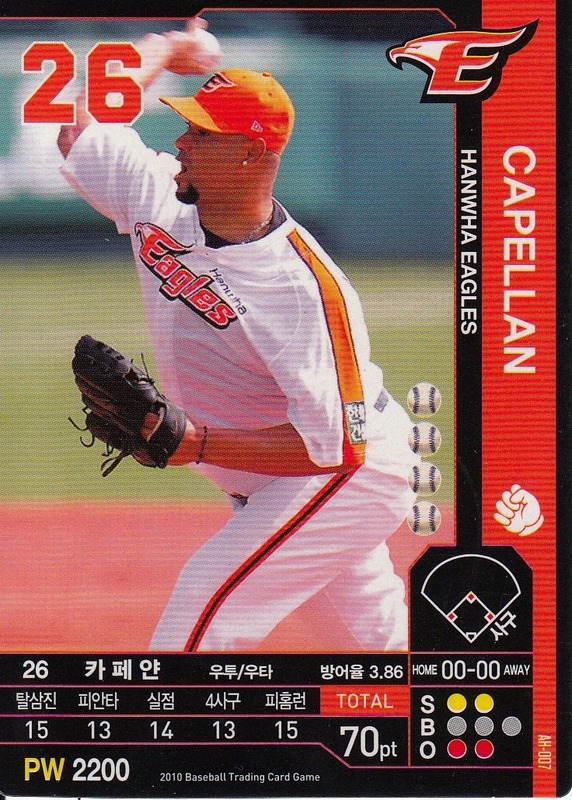 The first of three expected sets from Calbee this year was released a couple weeks back. The base set contains 103 cards, split up between 84 "regular" player cards, 12 "Exciting Scene" cards, 3 "Legend" cards and four checklist cards. 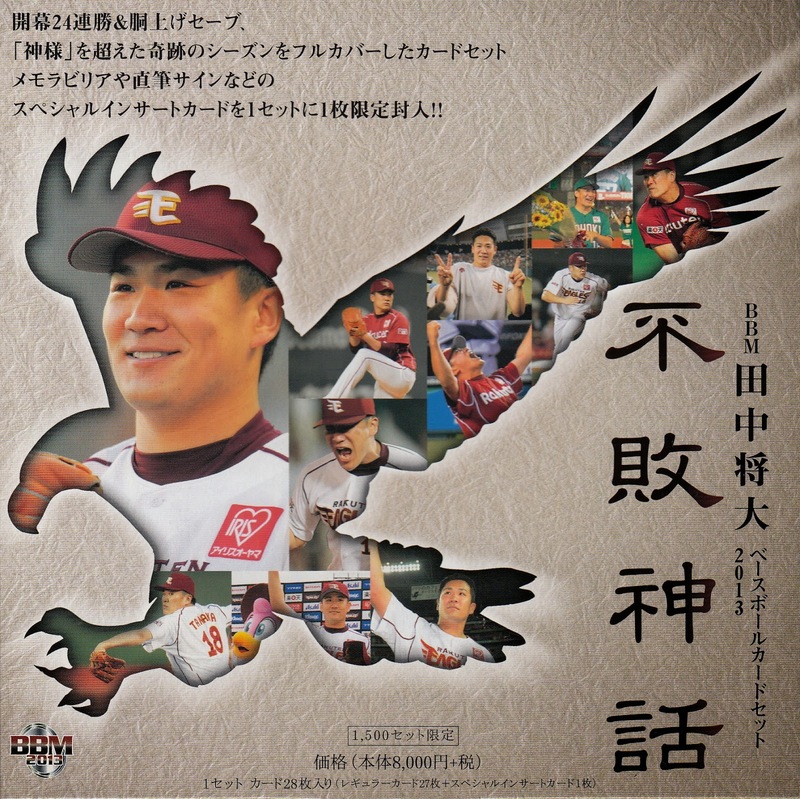 The three card "Legend" subset is for three players who retired at the end of the 2014 season - Atsunori Inaba, Makoto Kaneko and Tomoya Satozaki. Calbee had a similar subset in Series One last year. All the cards can be seen at Jambalaya (including the Star inserts and some of the mail-in premium sets and cards). I don't have a whole lot to add to the discussions that have been going on regarding DeNA's decision to void Yulieski Gurriel's contract and place Lourdes Gurriel on the restricted list. 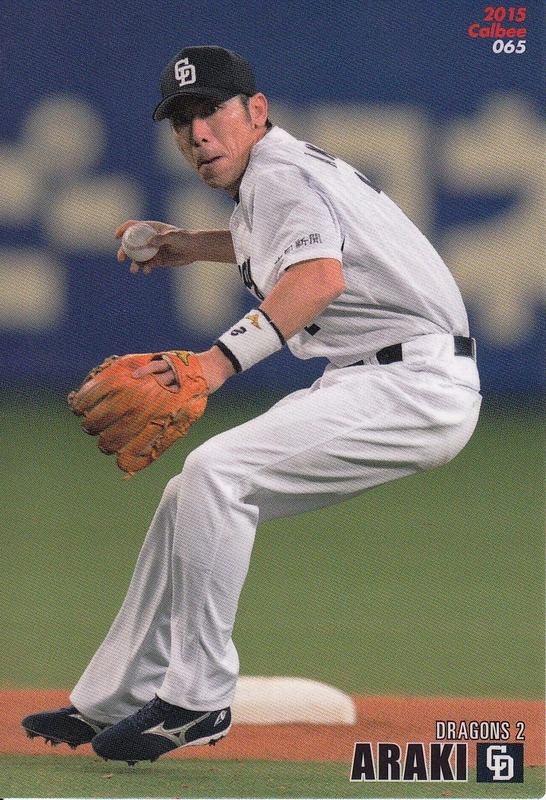 I think it's a shame that the elder Gurriel will not be in the Baystars lineup this year and I can't help feeling that the possibility of Gurriel being able to move to MLB in the near future is a factor in all of this somehow. But what do I know? 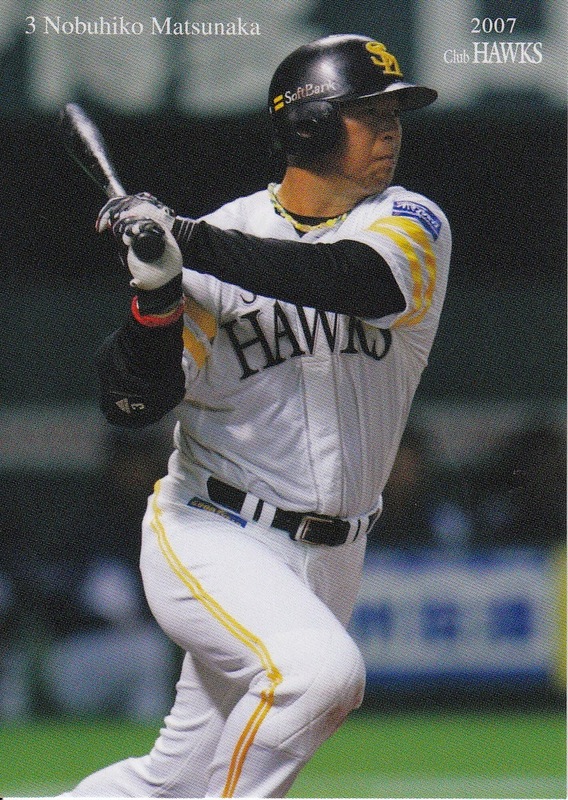 Actually what I do know is that despite the voiding of his contract, there will most likely be cards of Yulieski Gurriel in Japan this year. The BBM 1st Version checklist that appears in SCM 110 lists two cards for him - his "regular" card (#286) and a Cross Plasma card (#CP32). 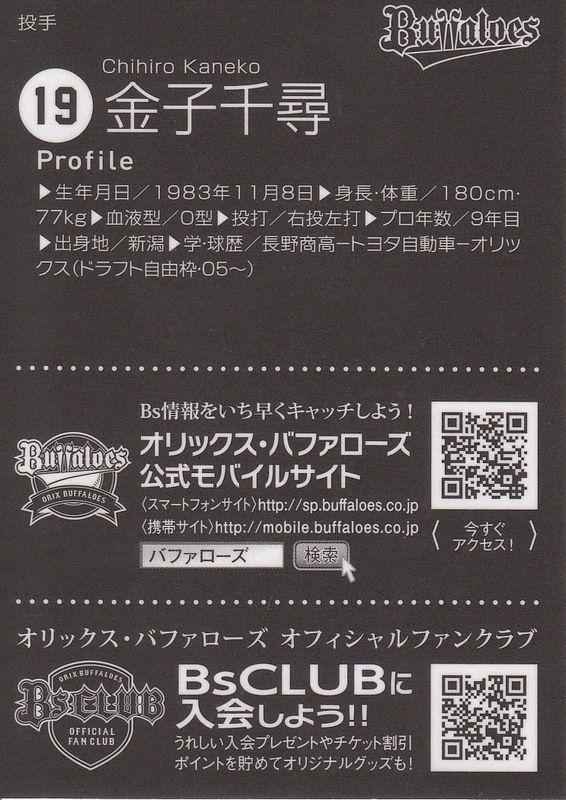 (The Cross Plasma card appears on the webpage for the set at BBM's web site). I suspect that it's unlikely that BBM will remove the card from the set as it's probably too late to do so - the set will be released in less than two weeks. 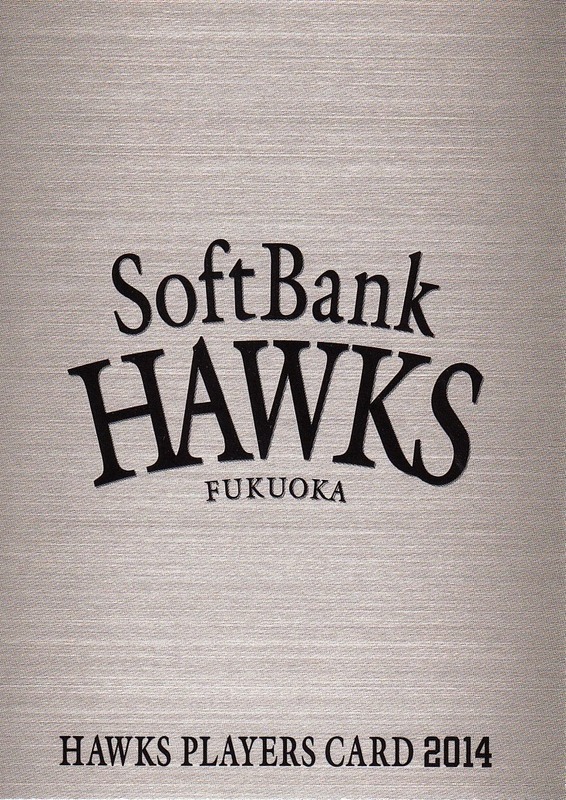 BBM put out a set celebrating the 10th Anniversary of Softbank buying the Hawks from Daiei about a month and a half ago. 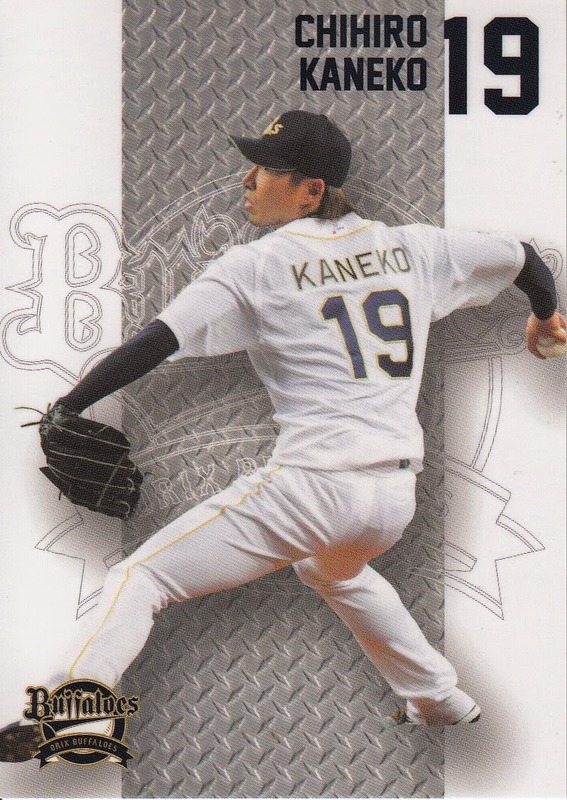 This set was a pack based set and featured 81 cards in its base set that were split between three groups - OB players, 2014 players and "Memories Of The Decade". 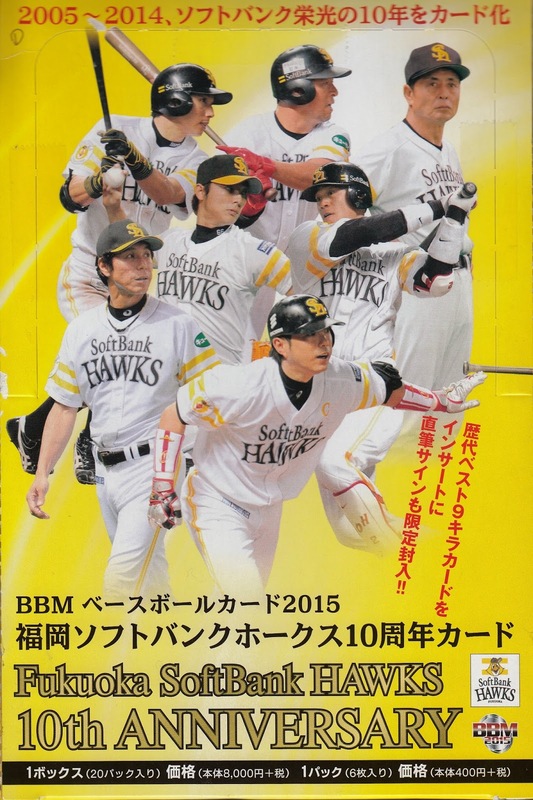 There are nine cards for the 2014 Hawks. 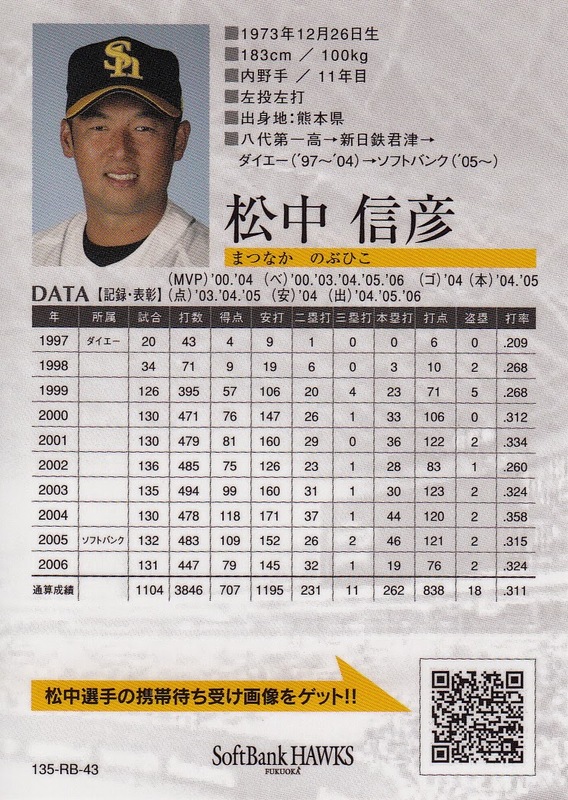 It's not quite a Best 9 for the 2014 team - there are two pitchers (Kenji Ohtonari and Tadashi Settsu) but no catcher. 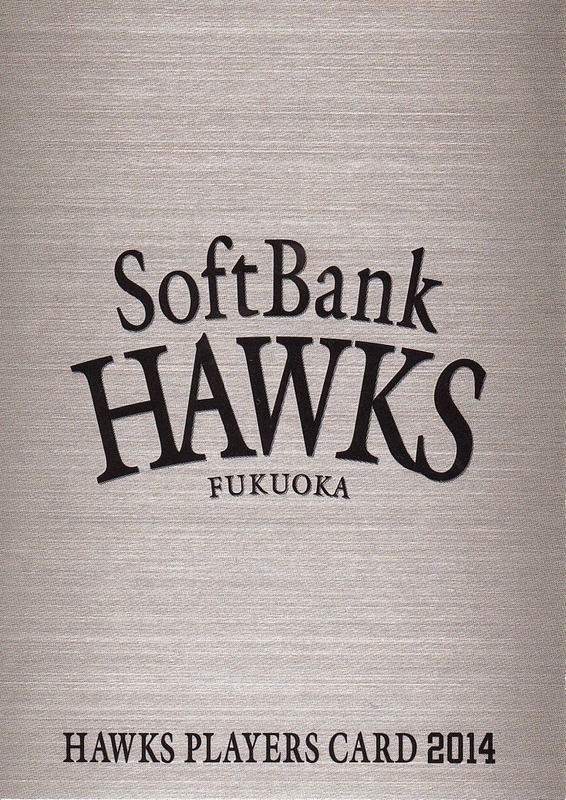 The other seven players are Yuya Hasegawa, Yuichi Honda, Kenta Imamiya, Nobuhiro Matsuda, Nobuhiko Matsunaka, Seiichi Uchikawa and Yuki Yanagita. 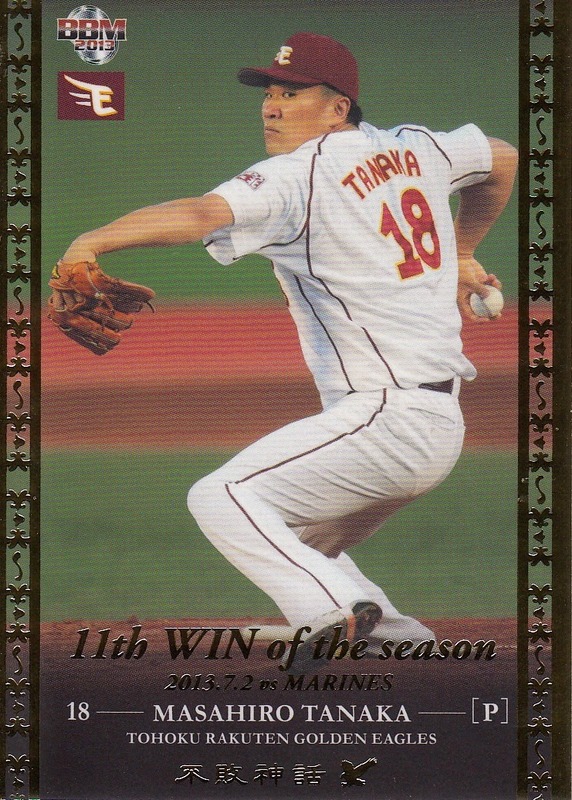 The "Memories of The Decade" subset is also nine cards. Instead of being numbered with the rest of the set, they are numbered M01 to M09. 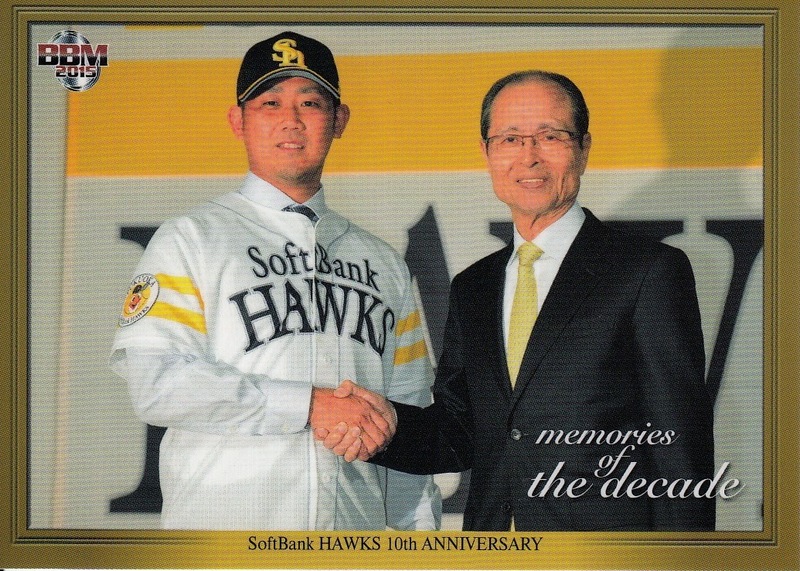 The "memories" being commemorated are the official introduction of the Softbank Hawks in January 2005, the Interleague Championship in June 2008, Koji Akiyama taking over as manager from Sadaharu Oh in October of 2008, clinching 1st place in September 2010 (I think), the 2011 Nippon Series Championship, their walkoff win against Orix last October to clinch 1st place, their 2014 Nippon Series Championship, Kimiyasu Kudoh being named manager in November 2014 and Daisuke Matsuzaka being signed in December 2014. I'm not going to lie - this is an odd little set. 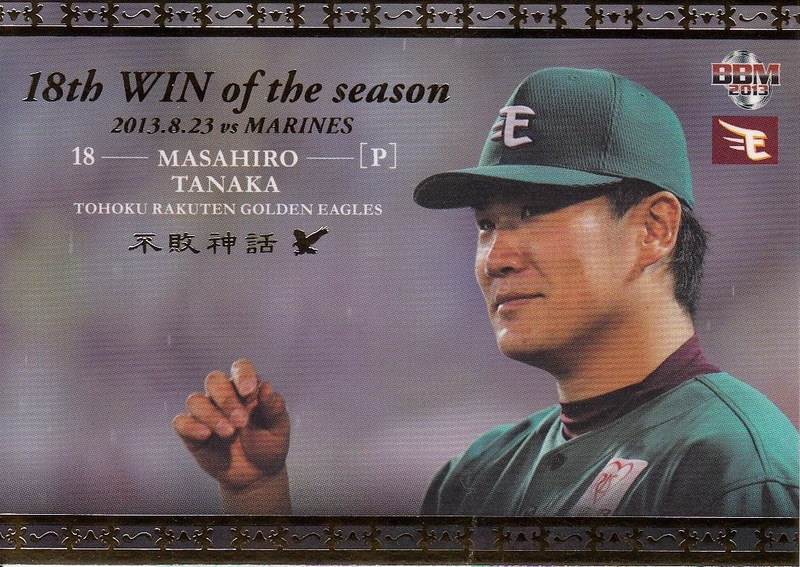 First of all, it's kind of strange that this set came out this year rather than last year since 2014 was Softbank's 10th season (the Eagles started in 2005 as well and their 10th Anniversary set came out last year). It's also kind of odd that 44% of the most memorable moments for the Hawks happened between October and December of last year. 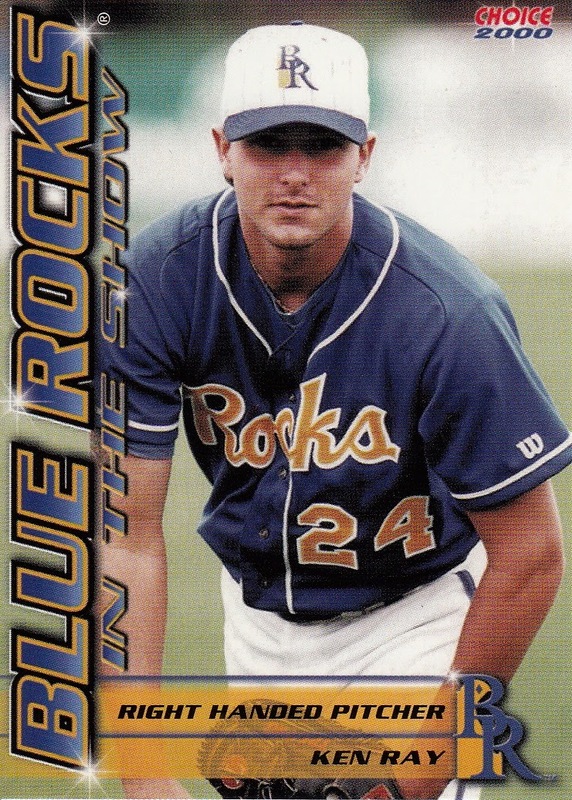 It's also extremely odd that all the player cards show the players in their home white uniforms - no away jerseys, none of the colorful alternate jerseys, nothing but white tops. 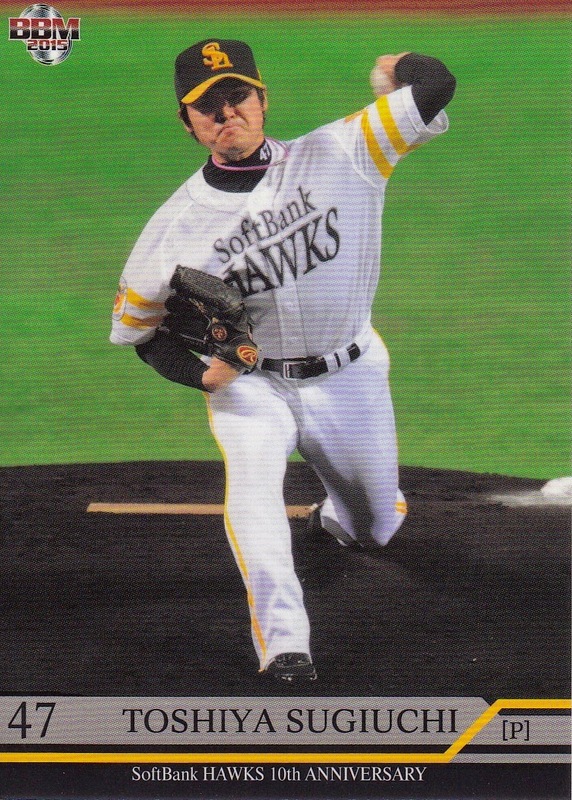 I kind of get the feeling that the Hawks and/or BBM decided that they needed to get a card out of Matsuzaka in a Softbank uniform as quickly as possible and worked backward from there. This set just seems kind of superfluous, especially considering that there was a 75th Anniversary set for the Hawks just a few years ago. You can see all the cards at Jambalaya and Ryan has a post describing the set as well. 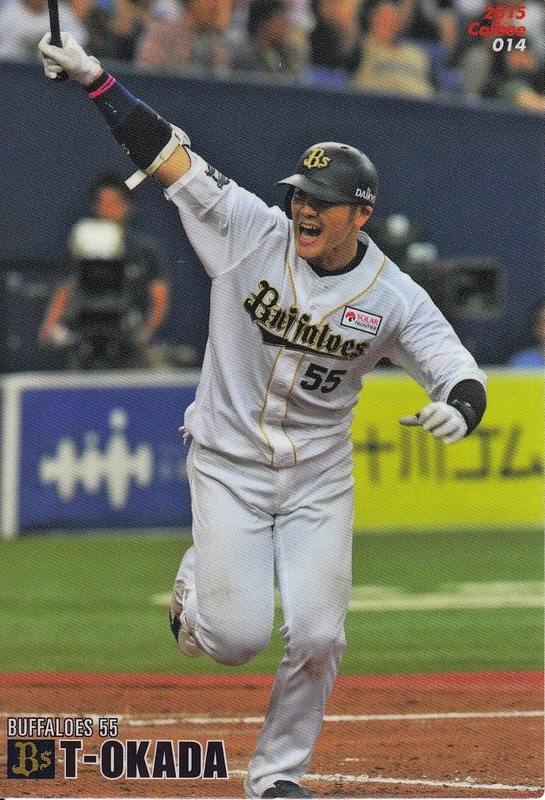 The Giants beat the Tigers yesterday by a score of 9 to 5. 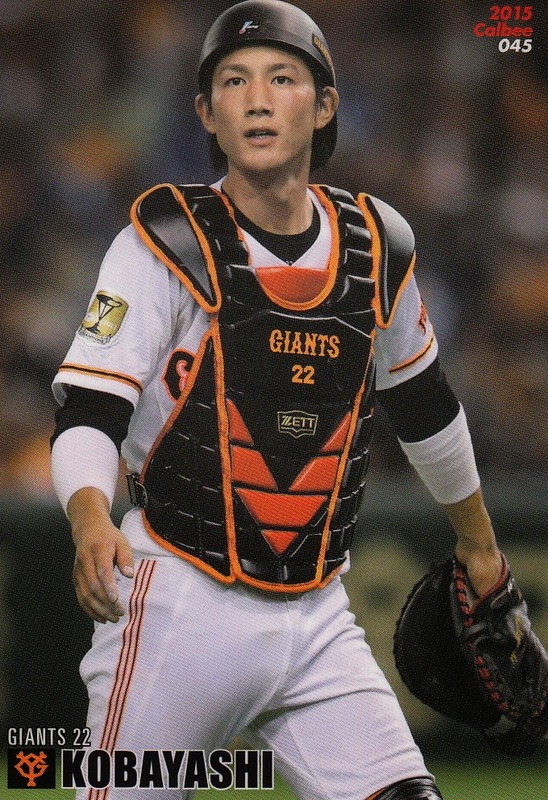 This was significant because it was the 1000th time that the Giants had beaten the Tigers in the two team's history going all the way back to 1936. 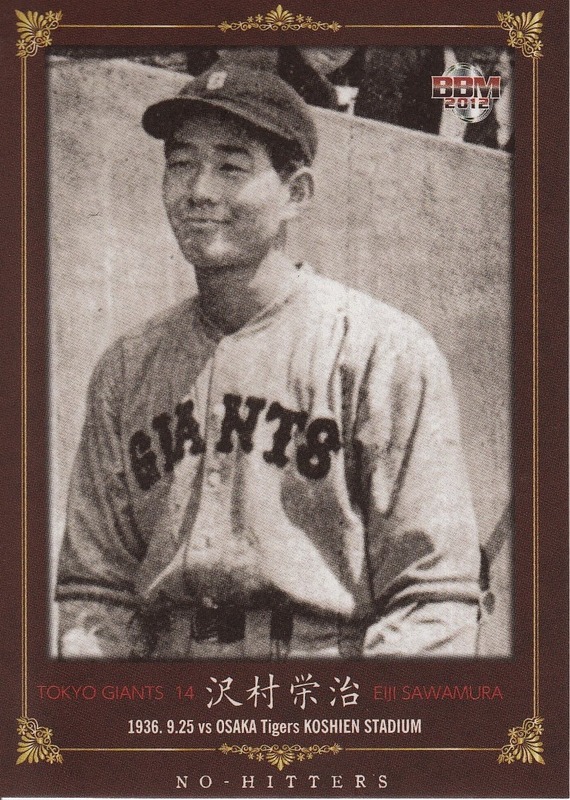 If I'm reading the translation of this Nikkan Sports article correctly, it looks like the Giants' first ever victory against the Tigers was Eiji Sawamura's no-hitter against them on September 25, 1936. 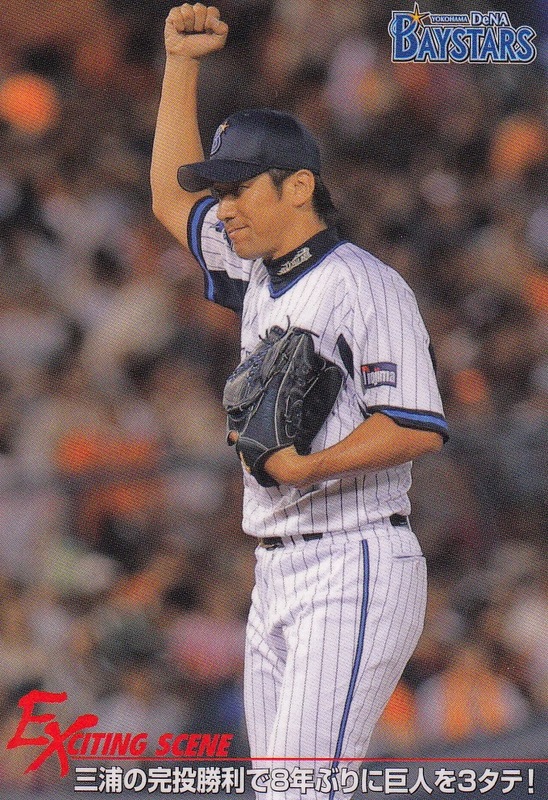 This was also the first no-hitter in Japanese professional baseball history. 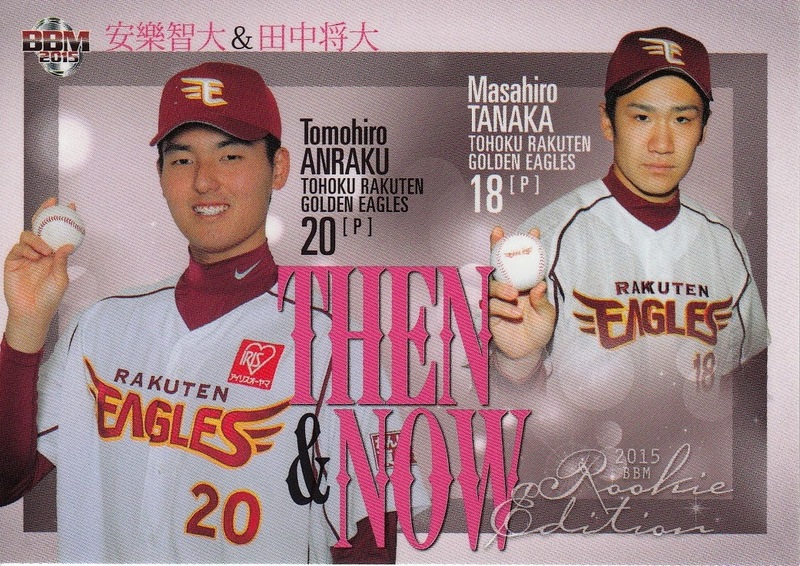 Some more team issued sets, this time from Orix. I thought that the seller I bought this from had two other auctions for cards from this set that I did not bid on but I've been searching completed auctions on Ebay and not finding them. 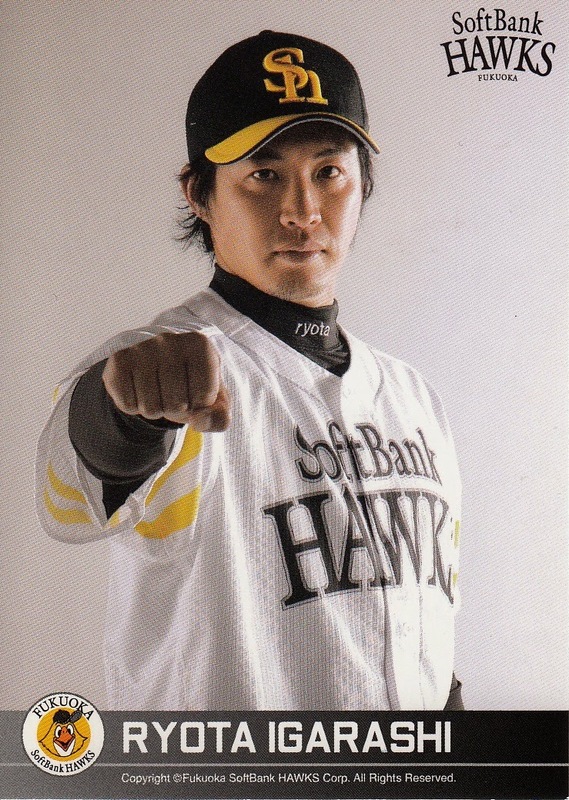 Actually now that I do some looking around, Kohdai Matsumoto was only with Orix in 2013 so that would pretty much confirm the year.